One of my favorite quotes is “Wherever you are, be all there.” Jim Elliot was wise beyond his years when he died at the hands of Ecuadoran natives in 1956, he could not have foreseen the technological advances the world would acquire in the next 70 years. It’s hard to “be all there” when a 4″ long device that sits in the palm of your hand can take you on an exploration of someone else’s through YouTube, Instagram, or Snapchat. Why be all there with your own family when you can stream a valuable podcast or music video? 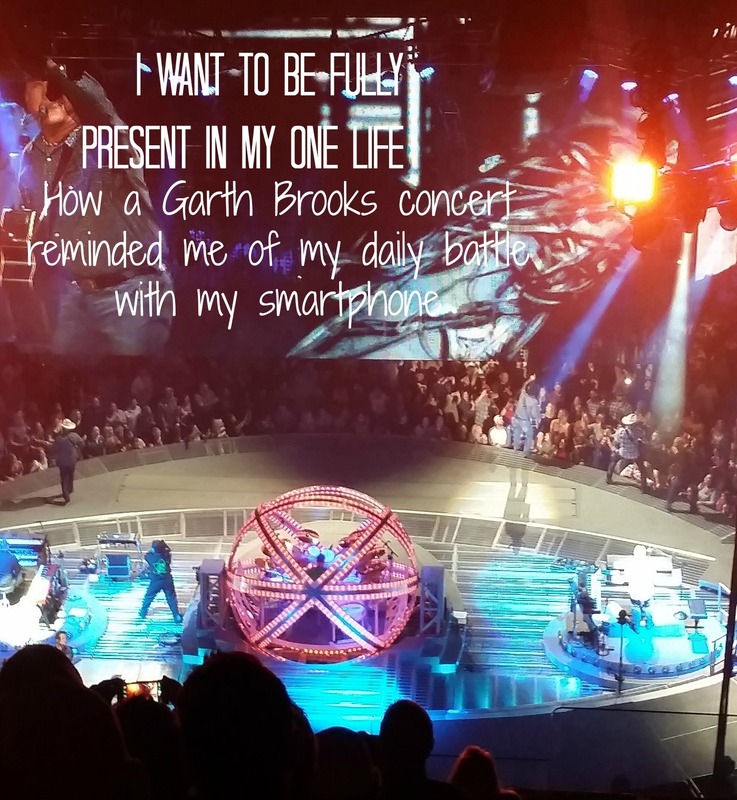 This hit me even more this past Friday night when we saw Garth Brooks in concert. The first time he had been to Ohio since 1996 (I was 13? What? ), we had friends that had tickets come available at the last minute. To say that I was excited was an understatement, but as Brian and I stood up and sang every song like it may be the last time we’d ever sing it, I noticed something- Row after row of people in front of us were not standing. Not singing. They were holding their phones and recording every minute. Ok, maybe they can post these videos to YouTube and make an extra buck or maybe they wanted to show their kids the fun night out. My question is this: How are you fully present in life if you’re viewing everything through a 4″ screen? Why pay $75 for a seat at a concert if you’re not really going for the concert? How do we show value to the people we’re with if we’re not engaged with them but engaged with a device? I struggle with my cell phone as much as anyone else. It can be addicting to check-in on Facebook, post a photo to Instagram, or record a snap of my kids! As I’ve thought more and more the past few months about how I can be fully present with my family I’m convicted (and convinced) that many times I’m with my family in my body but not in my mind. This has been difficult as a new blogger, too. Jackson thinks that we go on walks for “blog.com” (he’s a funny kid!) and I worry that maybe he’ll see everything as a social media post instead of fun, family times. I’m often behind the camera and admiring the view only through the eyes of a pending photograph. Friday night reminded me that nothing beats being fully present with my husband, belting out each tune. I’d rather enjoy my children’s funny sayings firsthand, not while I point a tiny camera at them. My phone is a lifeline but it’s also a shackle. A.W. Tozer said, “Among the enemies to devotion none is so harmful as distractions.” While Tozer was speaking of our relationship to God, his words could be used for any relationship- distraction IS an enemy. I want to keep my eyes on the prize (God, my husband, my family) and not on the little device that begs me to draw away. Do you struggle with spending too much time on your mobile device? Have you been to a concert and noticed no one is actually watching the concert anymore? How do you deal with this?